In “An Eye-Scanning Lie Detector Is Forging a Dystopian Future,” Wired science writer Mark Harris investigates “EyeDetect,” a new scientifically unproven lie detector being hawked as a replacement for the old scientifically unproven polygraph. Sitting in front of a Converus EyeDetect station, it’s impossible not to think of Blade Runner. In the 1982 sci-fi classic, Harrison Ford’s rumpled detective identifies artificial humans using a steam-punk Voight-Kampff device that watches their eyes while they answer surreal questions. EyeDetect’s questions are less philosophical, and the penalty for failure is less fatal (Ford’s character would whip out a gun and shoot). But the basic idea is the same: By capturing imperceptible changes in a participant’s eyes—measuring things like pupil dilation and reaction time—the device aims to sort deceptive humanoids from genuine ones. It claims to be, in short, a next-generation lie detector. Polygraph tests are a $2 billion industry in the US and, despite their inaccuracy, are widely used to screen candidates for government jobs. 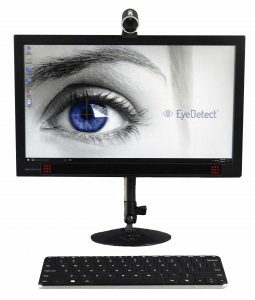 Released in 2014 by Converus, a Mark Cuban–funded startup, EyeDetect is pitched by its makers as a faster, cheaper, and more accurate alternative to the notoriously unreliable polygraph. By many measures, EyeDetect appears to be the future of lie detection—and it’s already being used by local and federal agencies to screen job applicants….